DIE BODEN SCHAFFT in Berlin is a young initiative for a new soil science and culture. Far away from perfection we are working on-site creating new soils for living places and democratic knowledge. DIE BODEN SCHAFFT faithfully supports the idea of sustainable development, fairness and international cooperation in every area where the love of nature, awareness, art and public welfare are the main stimuli for action. In the middle of Berlin the airport of Tempelhof has been opend to the public in 2010. 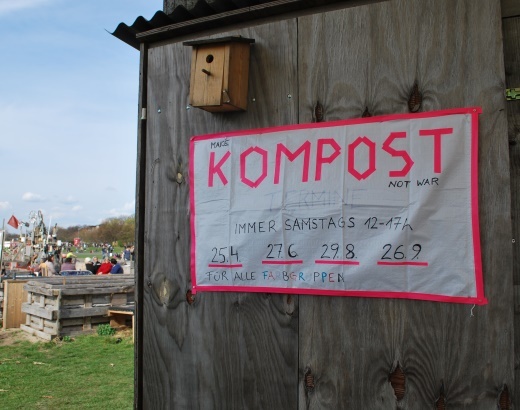 2011 the intercultural community garden Allmende Kontor was spontaneously founded by hundreds of urban dwellers to get into better contact with each other and our urban base. Since 2012 we are gardening and hot composting together creating an incredible and cheerful diversity of microbes, fungi, plants and animals on this former urban desert. We are open for all kinds of participants and enjoyed by thousands of visitors from all over the world. Our garden is neither funded or sponsored by communal or commercial facilities, just formed and run by individual power and activity. 2015 the local initiative DIE BODEN SCHAFFT has been founded by Martina Kolarek, soil scientist, garden activist and artist. In January she published the book „Kompostieren!“ (engl. Compost! ), which is a detailed code of practice to encourage and enable all kinds of people to support and implement the technique of hot composting by themselves and to create lively and fertile soils for a common and plural future together.